Ruddocks Ranch – For all your outdoor adventures! 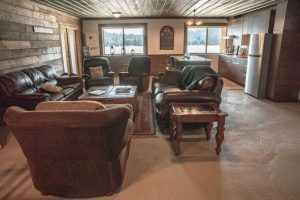 We offer 4 rustic cabins that sleep 2, the lodge that sleeps 8, several camping spots with no hook ups and options available for larger groups. Please contact us with your requirements! Wild rainbow trout, fly fishing only, barbless hooks - catch and release, no spinning rods or lures. Rainbows up to 10 lbs. or more! We do not stock the lake - they are all natural by managing the fishery. Ruddocks Ranch is a destination that feels as natural as a place you have known your entire life. A beautiful piece of British Columbia where you can relax in the country with trophy fly fishing at your doorstep. Ruddocks Ranch is the perfect all-season get away with activities that range from fly fishing vacations, bird watching, biking, hiking and cross country skiing or just plain rest and relaxation. Rod from "Fishing with Rod"
If you are looking for a quick peaceful fishing getaway from Vancouver, then Ruddocks Ranch is for you! 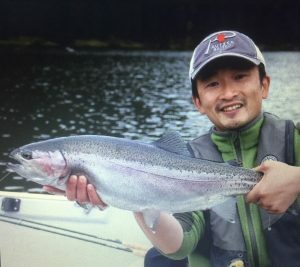 We have been returning to this hidden gem several times now and it is nice to have the entire lake to ourselves, while catching incredibly aggressive rainbow trout. Gord has done an excellent job on the new cabin which provides all the needs that you would find back home so you can have a comfortable stay while connecting to nature. From the moment you arrive you find yourself at peace. It has a magical quality to it that’s hard to describe. Scenery is absolutely stunning from the mirror of the lake to the snow capped mountains and meadows of wildflowers. Whether you have come to fish or just to relax the lodge has it all. Luxury and comfort meet old world charm at the spectacular log home the DiCastri family has built. If you are up for the fishing it is world class. Ruddocks Ranch is a beautiful getaway from the city, surrounded by natural beauty with a lake chock full of rainbow trout. There is nothing like waking up and watching the fog roll over the lake and the fish starting to surface! Call or text message anytime! !